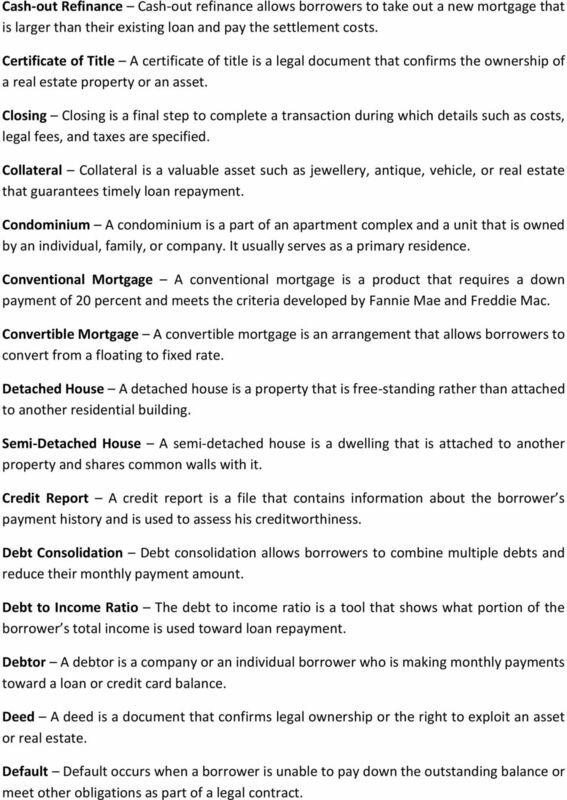 Download "MORTGAGE DICTIONARY. Amortization - Amortization is a decrease in the value of assets with time, which is normally the useful life of tangible assets." 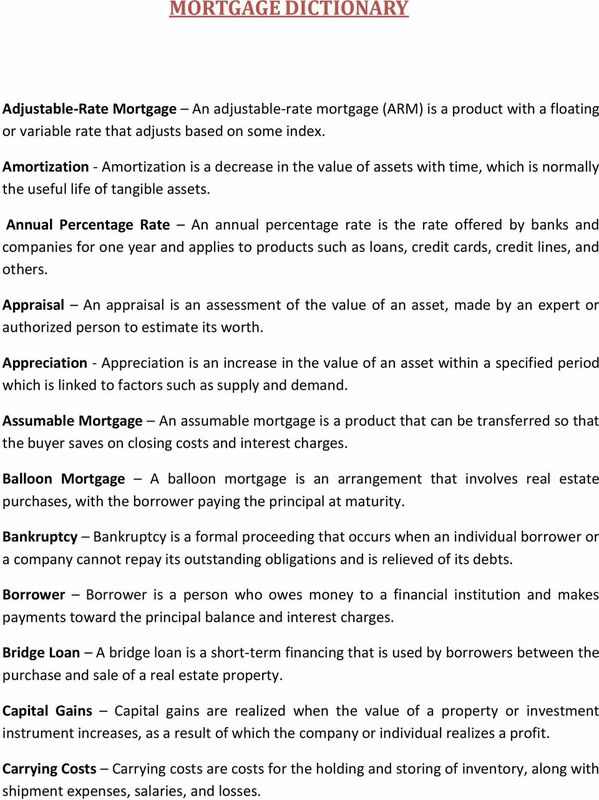 1 MORTGAGE DICTIONARY Adjustable-Rate Mortgage An adjustable-rate mortgage (ARM) is a product with a floating or variable rate that adjusts based on some index. Amortization - Amortization is a decrease in the value of assets with time, which is normally the useful life of tangible assets. Annual Percentage Rate An annual percentage rate is the rate offered by banks and companies for one year and applies to products such as loans, credit cards, credit lines, and others. Appraisal An appraisal is an assessment of the value of an asset, made by an expert or authorized person to estimate its worth. Appreciation - Appreciation is an increase in the value of an asset within a specified period which is linked to factors such as supply and demand. Assumable Mortgage An assumable mortgage is a product that can be transferred so that the buyer saves on closing costs and interest charges. Balloon Mortgage A balloon mortgage is an arrangement that involves real estate purchases, with the borrower paying the principal at maturity. Bankruptcy Bankruptcy is a formal proceeding that occurs when an individual borrower or a company cannot repay its outstanding obligations and is relieved of its debts. Borrower Borrower is a person who owes money to a financial institution and makes payments toward the principal balance and interest charges. Bridge Loan A bridge loan is a short-term financing that is used by borrowers between the purchase and sale of a real estate property. Capital Gains Capital gains are realized when the value of a property or investment instrument increases, as a result of which the company or individual realizes a profit. Carrying Costs Carrying costs are costs for the holding and storing of inventory, along with shipment expenses, salaries, and losses. 2 Cash-out Refinance Cash-out refinance allows borrowers to take out a new mortgage that is larger than their existing loan and pay the settlement costs. Certificate of Title A certificate of title is a legal document that confirms the ownership of a real estate property or an asset. Closing Closing is a final step to complete a transaction during which details such as costs, legal fees, and taxes are specified. Collateral Collateral is a valuable asset such as jewellery, antique, vehicle, or real estate that guarantees timely loan repayment. Condominium A condominium is a part of an apartment complex and a unit that is owned by an individual, family, or company. It usually serves as a primary residence. Conventional Mortgage A conventional mortgage is a product that requires a down payment of 20 percent and meets the criteria developed by Fannie Mae and Freddie Mac. Convertible Mortgage A convertible mortgage is an arrangement that allows borrowers to convert from a floating to fixed rate. Detached House A detached house is a property that is free-standing rather than attached to another residential building. Semi-Detached House A semi-detached house is a dwelling that is attached to another property and shares common walls with it. Credit Report A credit report is a file that contains information about the borrower s payment history and is used to assess his creditworthiness. Debt Consolidation Debt consolidation allows borrowers to combine multiple debts and reduce their monthly payment amount. Debt to Income Ratio The debt to income ratio is a tool that shows what portion of the borrower s total income is used toward loan repayment. Debtor A debtor is a company or an individual borrower who is making monthly payments toward a loan or credit card balance. Deed A deed is a document that confirms legal ownership or the right to exploit an asset or real estate. Default Default occurs when a borrower is unable to pay down the outstanding balance or meet other obligations as part of a legal contract. 3 Delinquency - Delinquency is a failure to satisfy debt obligation such as an outstanding credit card balance, mortgage, or income tax. Depreciation - Depreciation is a reduction of the value of an asset, made for accounting purposes, that is reflected on the income statement. Discharge - Discharge refers to debt relief that is granted by a bankruptcy court to a company or individual borrower. Down Payment A down payment is an amount of money paid toward the purchase of a real estate property or vehicle, which is a percentage of the outstanding balance. Duplex A duplex is a residential building that has separate entrances for two units sharing common walls. Equity Equity refers to ownership interest that gives shareholders the right to vote and is in the form of preferred or common stock. Fair Market Value Fair market value is the price of an asset or real estate that a seller can ask for on an open market. Fannie Mae Fannie Mae is a government-backed entity that securitizes mortgage loans, sells them to third parties, and helps borrowers to avoid foreclosure. Federal Tax Lien Federal tax lien is assessed when taxpayers fail to pay estate, income, and other types of taxes. FHA FHA refers to federal tax lien or unpaid taxes that are owed to the Internal Revenue Service. First Mortgage A first mortgage is a priority debt that is repaid before other loans in the event of insolvency or default. Fixed-Rate Mortgage A fixed rate mortgage is a loan with fixed payments and interest rate that is not affected by rate fluctuations. Foreclosure Foreclosure occurs when a borrower defaults, and the financial institution seizes an asset to recover the outstanding balance. Freddie Mac Freddie Mac offers borrowers home financing and buys loans from mortgage bankers and other financial institutions. Home Equity Line Of Credit A home equity line of credit is a loan extended to homeowners whereby the house serves as a guarantee or collateral. 4 Home Insurance Home insurance is offered to individuals to cover for damages under certain circumstances. Floods, hurricanes, tornadoes, and earthquakes are excluded from the policy. Index An index is an indicator that includes the values of stocks and shows how different investments perform, helping investors to make decisions. Interest Interest is a percentage or fee charged by financial institutions and other entities for the use of money or assets. Interest Rate Interest rate is a rate that is used to calculate finance charges paid by borrowers along with the principal balance. Jumbo Mortgage A jumbo mortgage is a financial product that allows people to borrow more and buy a higher-priced real estate property. The interest rate is higher than on other loans. Land Land is a resource that can be used for production or residential use, and ownership allows companies and individuals to exploit minerals, oil, soil, and other resources. Leasehold Leasehold refers to a real estate property that is held under the terms of a rental contract, allowing other parties to reside or use the property within a certain period. Liabilities Liabilities are outstanding obligations to suppliers and lenders that occur during the course of normal operations. Lien Lien defines the right of financial institutions to seize and sell assets used as collateral in case of default. Line of Credit A line of credit is a source of financing that allows borrowers to withdraw funds multiple times and within an extended period of time. Loan A loan is an asset or money borrowed by business and individual customers in exchange for future payment of interest charges and principal. 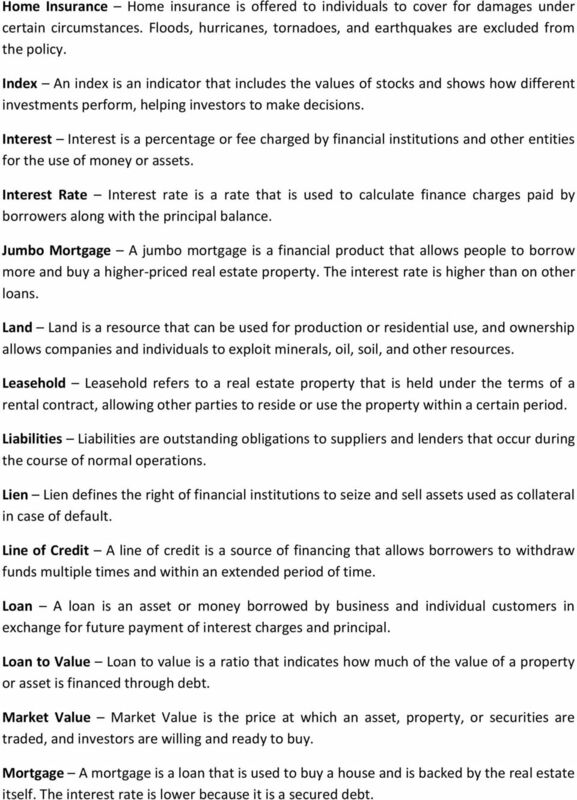 Loan to Value Loan to value is a ratio that indicates how much of the value of a property or asset is financed through debt. Market Value Market Value is the price at which an asset, property, or securities are traded, and investors are willing and ready to buy. Mortgage A mortgage is a loan that is used to buy a house and is backed by the real estate itself. The interest rate is lower because it is a secured debt. 5 Mortgage Broker A mortgage broker is a professional who acts as an intermediary between homebuyers and financial entities and helps clients to find a suitable mortgage product. Mortgage Insurance Mortgage insurance is a product that guarantees debt repayment in the event of permanent disability or death of the policyholder. Mortgage Payment Options Mortgage payment options allow borrowers to choose a preferred schedule of repayment, whether monthly, bi-weekly, or another arrangement. 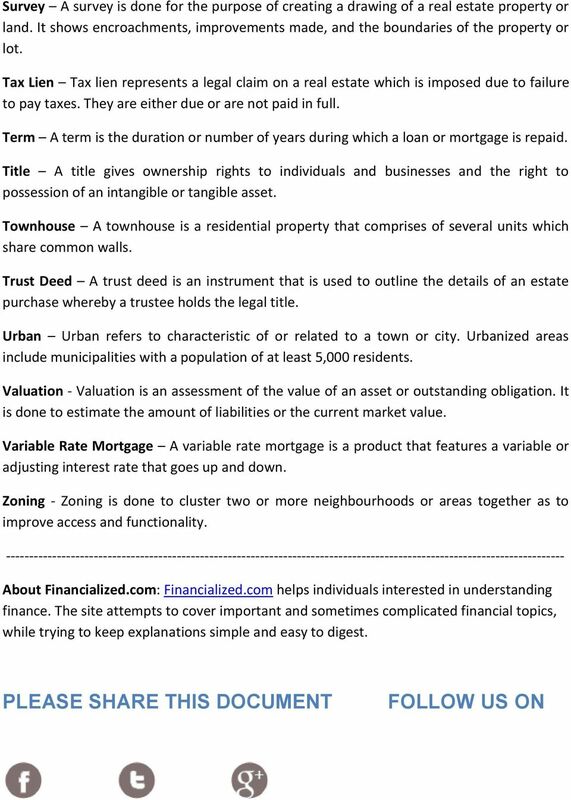 Mortgage Types Mortgage types differ in terms of interest rate and repayments and include first, pre-approved, 6-month convertible, multiple term, and other varieties. Mortgagee A mortgagee is a bank, credit union, caisses populaire, or another establishment that offers loans to homebuyers to help them to finance real estate purchases. Mortgagor A mortgagor is a business or individual customer who borrows money for a home purchase and offers the property as collateral. Negative Amortization Negative amortization occurs when the amount paid is not sufficient to cover the interest charges, and the outstanding balance increases. Note A note is a debt instrument with a maturity that varies from 2 to 10 years and is traded above, at, or below its redemption or principal value. Origination Fee An origination fee is a payment made by bank customers for processing their application and opening an account. Finance companies and brokers charge activation fees. 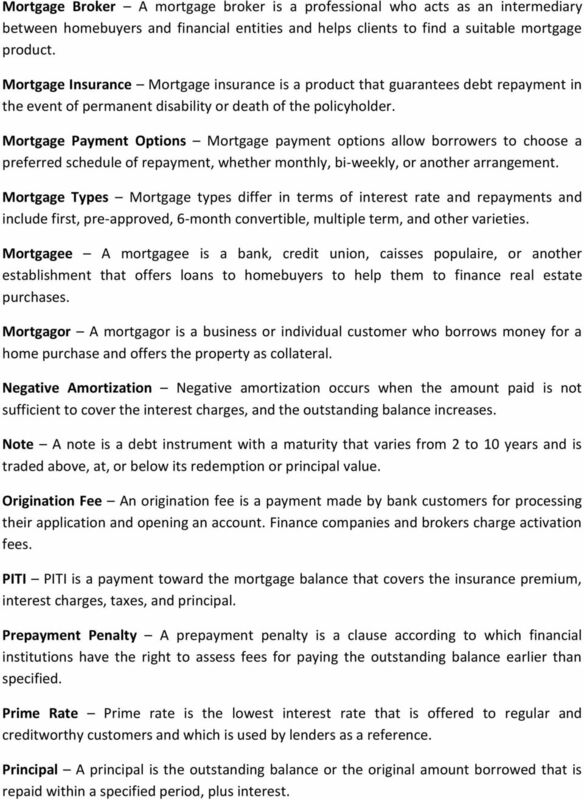 PITI PITI is a payment toward the mortgage balance that covers the insurance premium, interest charges, taxes, and principal. Prepayment Penalty A prepayment penalty is a clause according to which financial institutions have the right to assess fees for paying the outstanding balance earlier than specified. Prime Rate Prime rate is the lowest interest rate that is offered to regular and creditworthy customers and which is used by lenders as a reference. Principal A principal is the outstanding balance or the original amount borrowed that is repaid within a specified period, plus interest. 6 Promissory Note A promissory note is a legal agreement that specifies the terms of a financial transaction so that money is payable on a certain date or on demand. Property Tax Property tax is paid by owners and assessed by the local authorities. The amount due depends on the value of land and real estate. Purchase Agreement A purchase agreement is a legally binding contract that specifies the terms of the purchase of machinery and equipment, goods, services, or real estate. Qualify Qualify refers to meeting the eligibility criteria for some financial service or product or fulfilling certain conditions. Real Property Real property covers tangible assets such as infrastructure, plants, buildings, and residential units that are owned, managed, or exploited by a company or individual. Refinancing - Refinancing occurs when a borrower chooses to replace an existing loan with a new one. It also occurs when the interest rate and schedule of repayment are modified to offer more attractive terms. Reverse Mortgage A reverse mortgage allows individuals to borrow against their home value. The property is sold when the homeowner passes away which serves to repay the principal balance. Second Mortgage A second mortgage is a debt instrument in the form of a home equity line of credit or home equity loan. It is subordinate to priority debts, and the interest rate is higher. Seller Financing Seller financing is money offered to companies and individuals for the purchase of some asset. The loan is extended by the seller to cover a percentage of the purchase price. Simple Interest Simple interest is calculated by multiplying the original loan amount or outstanding balance by the term (duration of the loan) and the rate of interest. Sub-Prime Borrower A sub-prime borrower is a company or individual who has a poor credit history and is considered a high risk. It is the opposite of a prime borrower with an impeccable payment history. Subprime Lenders Subprime lenders offer loans to borrowers with tarnished credit and a history of late payments and delinquencies. They charge high interest rates to offset the risk of default. 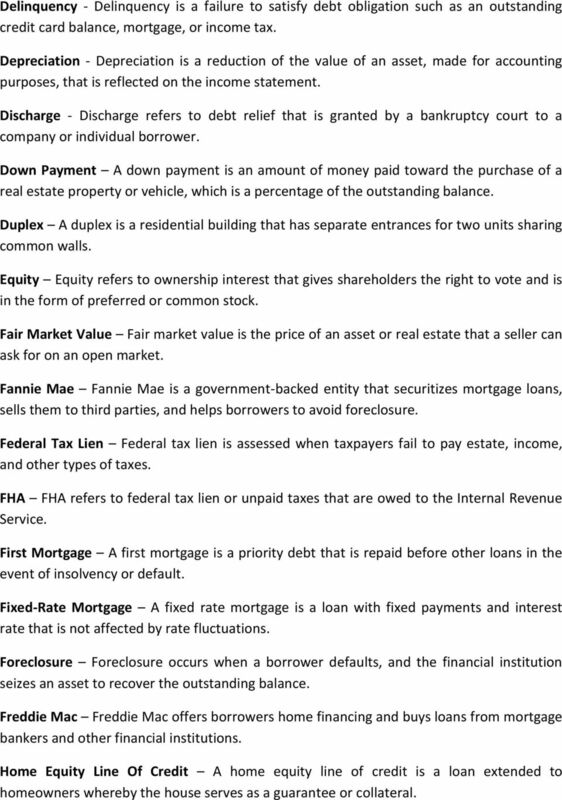 Mortgage Glossary. Mortgage loans under which the interest rate is periodically adjusted based upon terms agreed to at the inception of the loan. Adjustable Rate Mortgage (ARM) a mortgage with a variable interest rate, which adjusts monthly, biannually or annually. amortization The repayment of a mortgage loan by installments with regular payments to cover the principal and interest. Different Types of Loans All loans, no matter what they are, are either secured or unsecured. Knowing the difference can better help you understand how they work and what to expect when applying for one. 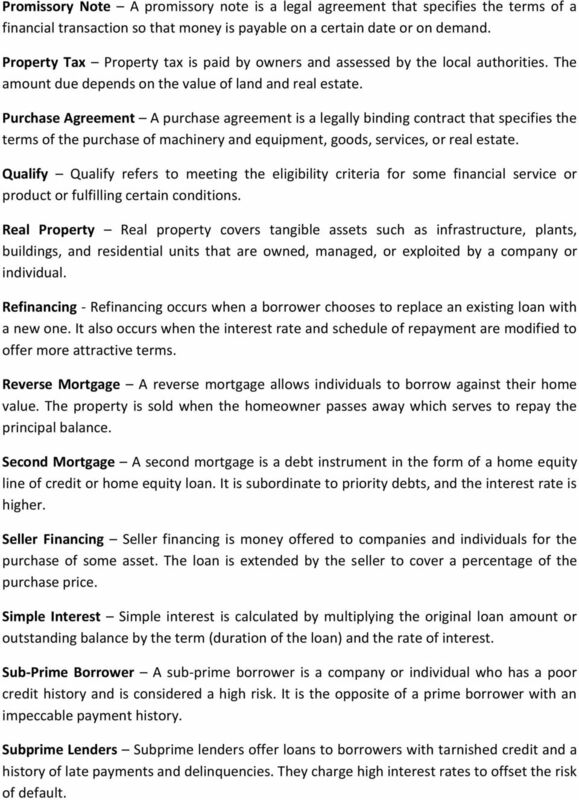 HOME LENDING TERMS. A payment by a borrower in excess of the scheduled principal amount due, in order to reduce the remaining balance of the loan. WWW.WINTRUSTMORTGAGE.COM WINTRUST.COM/MYHOME HOMEBUYER S MORTGAGE GUIDE HELPFUL INFORMATION ABOUT THE MORTGAGE PROCESS TO GUIDE YOU AS YOU PURCHASE YOUR NEW HOME. www.wintrust.com/myhome WHY WINTRUST? Finance 382 Real Estate Principles and Practice Instructor: Jan E. Beran Student s Name Version A FILL IN YOUR NAME (Lastname, Firstname) WHERE INDICATED, BE SURE TO FILL IN THE CORRESPONDING BUBBLES. Presented by Concorde Mortgage Co.
Assumable Mortgage: A loan that can be taken over, or assumed, by a buyer when the mobile home is sold. The Business Library Resource Report #35 Your Assets: Financing and Refinancing Properties Personal, Investment, and Business Properties! Basic Analysis of How and When! Fixed vs. Variable Interest Rate!